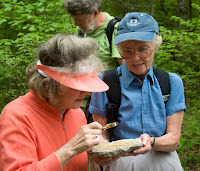 I had a wonderful hike at Haw Ridge this morning with 15 wildflower enthusiasts. Three of the folks had gone on the House Mtn. 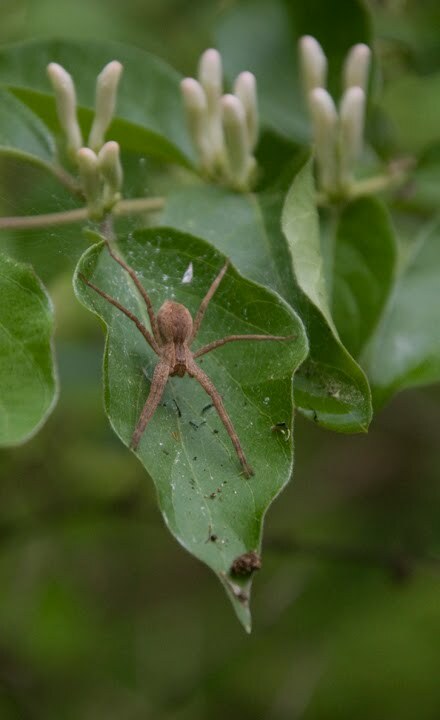 hike with me 2 weeks ago, I'm glad that one didn't scare them away! :) We had been pretty worried about the weather, the forecast was calling for rain and storms for the afternoon, but at 10:00 a.m. the sky was mostly blue. 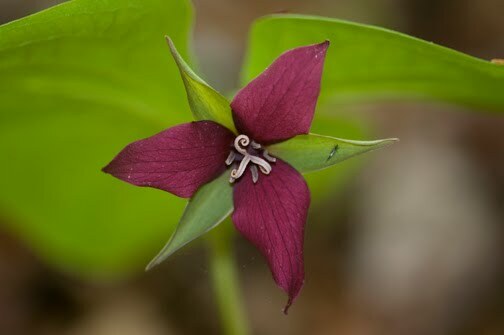 It didn't take us long to start seeing flowers along the trail. In all, we saw 40 different kinds of flowers, not bad since we didn't go very far! One of the first ones was the pretty Blue Star (a.k.a. Blue Dogbane). Cumberland Spurge, Squawroot, Foamflower, Yellow Mandarin, Wood Sorrel, Pale Blue-eyed Grass, Dwarf Cinquefoil, Wister’s Coralroot, Wild Hyacinth, Yellow Horse Gentian, Wild Comfrey, Cudweed, Corn Gromwell, Black Haw (right), Smooth Meadow Parsnip, Bluets, Spring Vetch. 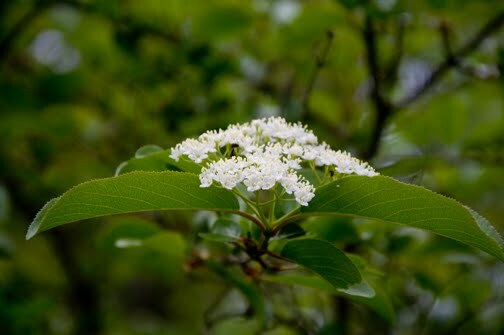 We won dered if the Black Haw is how Haw Ridge got its name! Here, Lynn and Rita observe a fossil-laden rock we found along the trail. 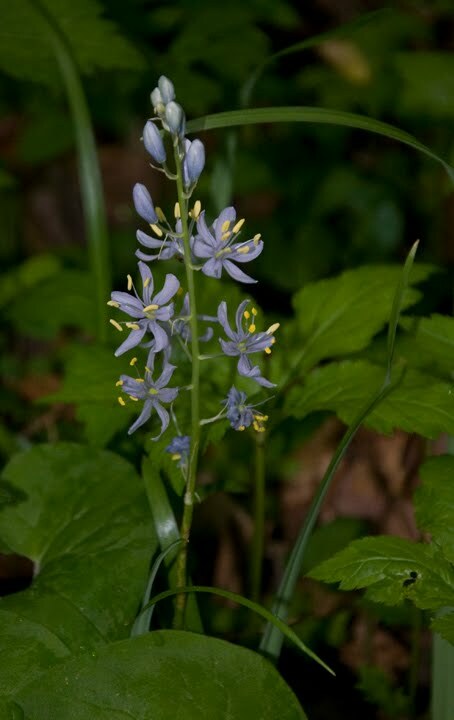 One of the exciting finds of the morning was the lone Wild Hyacinth plant that was blooming near the inlet. 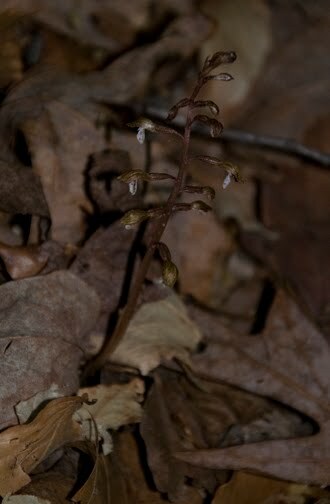 Not too far away was a Wister's Coralroot, a small brown orchid. I was glad I knew where to find it, I would have pas sed it by otherwise. 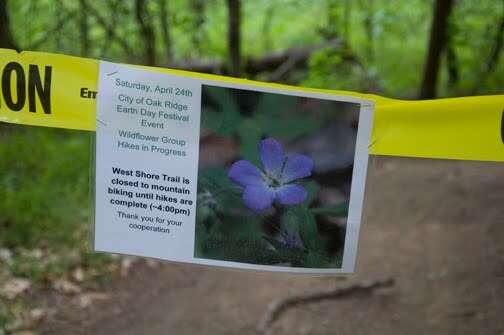 The trail we were hiking on had been closed to mountain bikers for our safety, I was a bit preturbed to see that some people ignored the signs, one had been taken down. It is hard to have 15 people on the trail and have guys on mountain bikes wanting to get past. Fortunately, one of the hikers had his phone, a friend of his called to tell him that rain was just minutes away! We really had to hoof it to get back to the car before the bottom dropped out! I sure didn't want to be up on the ridge, especially under the powerlines when it started thundering! Lightning and tall metal towers are not a good combination! I was pleased that the hike went well, I think everyone had a good time! Yesterday was my big day leading hikes at Frozen Head. I was a bit worried as I drove north through sprinkles of rain on my way there, but the clouds began to part and we ended up with a nice day! I met 25 of my new friends from the Southern Appalachian Nature Photographers (SANP) and from the Photoshop class that I'm taking in Knoxville. 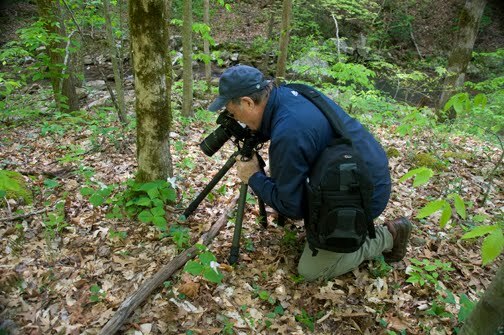 We headed off down the Panther Branch trail, it used to be an old road, so it was perfect for large numbers of tripods! 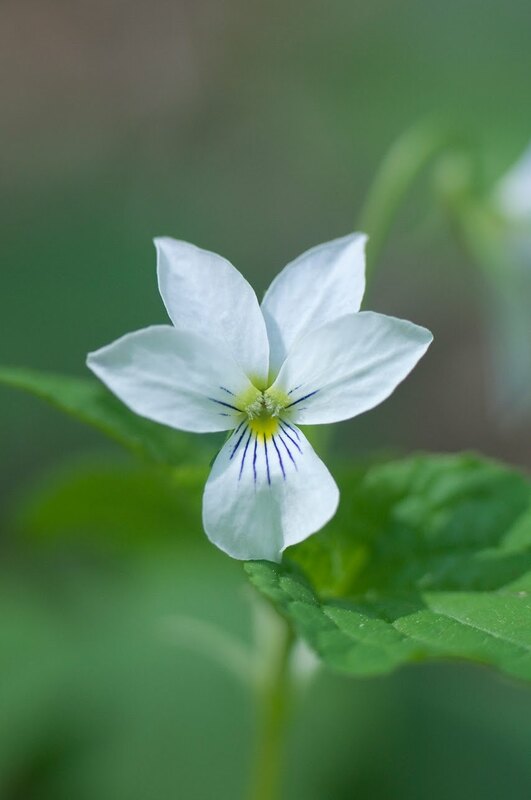 We enjoyed seeing the wildflowers, which included: White Trillium, Vasey's Trillium (below), Wild Geranium, L ousewort, Showy Orchis, Wood Vetch, Spotted and Yellow Mandarin, Dwarf Ginseng, Foamflower, Jack-in-the-Pulpit, Bishop's Cap, Canada violet (left) and several other violets, Violet Wood Sorrel, and the Cumberland Spurge. 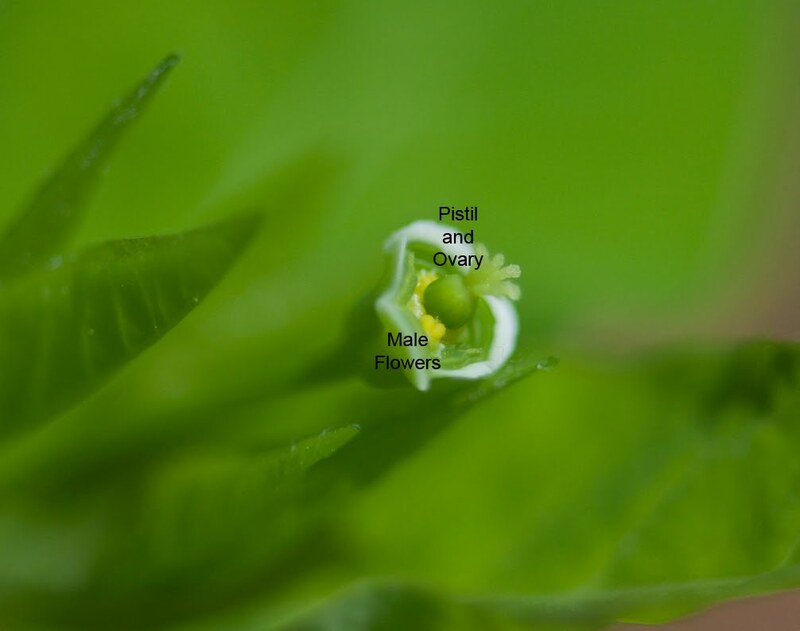 I like to tell my groups that the Cumberland Spurge (right) should have been the "Official Flower of the Women's Movement" because it has a superior ovary surrounded by male flowers! :) I've labeled this photo to show the parts. I get a kick out of picking on the men in the groups! Ha! 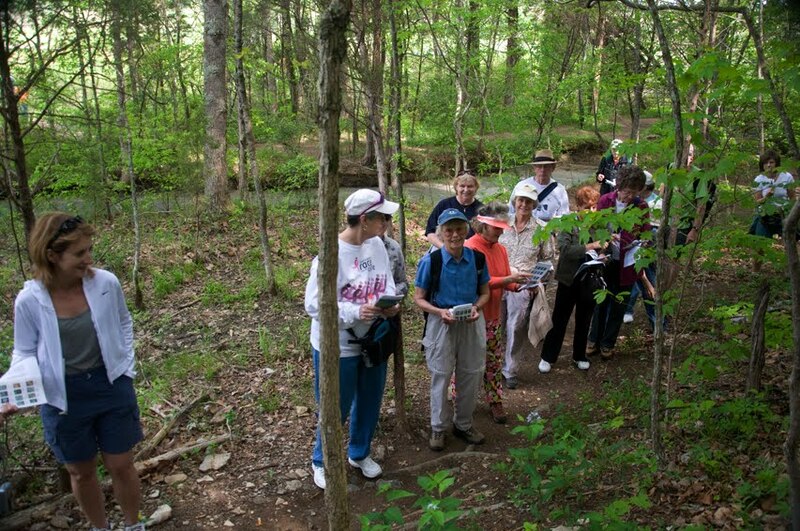 In the afternoon I led a hike for the park's wildflower pilgrimage. I was amazed and thrilled at the number of people who came to see and learn about the flowers! There were 25 - 30 folks who came. One 6th grade boy had a ball hunting for insects, millipedes and salamanders along the way. He added a lot of excitement as we went along the trails! 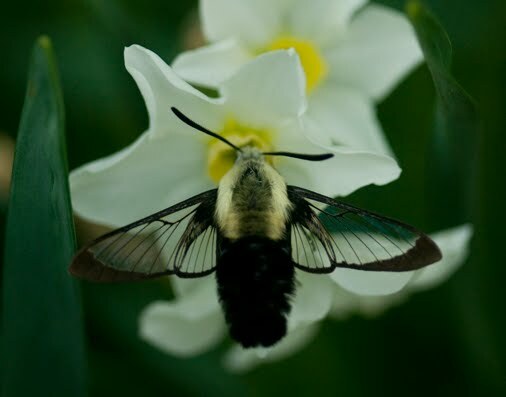 On Friday afternoon I was happy to see the first Hummingbird Clearwing Moth of the season in my yard. I think these moths should be called "Bumblebee moths" because that is what they really look like. I enjoyed watching it flit from flower to flower as it sipped nectar from the Narcissus plants. This was one rare time that it was still long enough to get a clear photo of it.